Why Agency Matters – Jon Andrews (@obi_jon_) argues that to get the most out of staff we need to support their agency, rather than continually dictate instructional models and learning outcomes. The most conducive and productive professional environments for this have been those with high expectations intertwined with support. These environments resist compliance in favour of engagement which leads to responsible autonomy. The best leaders have been those who grow these organisations with two key things, trust and reciprocal relationships in unique contexts. The Know-How Continuum – Chris Munro (@cmunroOZ) unpacks the challenge of staying in the coachee’s context as long as possible, rather than jumping to ideas and supposed solutions. The aim is to keep responsibility and ownership with the coachee. Introducing a suggestion with something like “What I’ve seen work in the past is….“, to some degree, puts the idea out there in neutral territory without the coach claiming ownership of it. This is very different from “Well, what I think you should do is…“. For (teacher) coaches (or perhaps just humans in general!) this can be a difficult thing to do. Dear John – Brad Gustafson (@gustafsonbrad) writes an open response to a parent who raised concerns that digital literacies, such as social media, were being focused at the expense of foundational skills, designed to create a space for debate, rather than an answer to a question. When our answers become more important than the questions others ask we will have done a disservice to the very nature of learning. How Do We Rebuild Trust in Our Schools – Corinne Campbell (@corisel) touches on the importance of being trustworthy, as well as what this might mean for schools and education. Our goal as individual teachers, as schools and systems, needs to be that we are perceived as worthy of trust. Evaluate Expert Advice on Schools and Advice – Richard Olsen (@richardolsen) questions the debate surrounding the ‘expert advice’ of Ken Wiltshire and Kevin Donnelly, suggesting that the real issue is our perspective on learning. Illeries model is useful in that it enables us to identify some of core differences between what different people believe about learning (and teaching.) While, I wouldn’t recommend using this model to adequately explain the differences between the various educational theories and theorists as some try to do, it does help us to start identifying where we agree and disagree with others, which in turn enables us to construct and articulate a well formed argument. Educators as Lead Learners – Jackie Gerstein (@jackiegerstein) provides a guide as to how educators can lead the learning in the classroom. The goal of this post is to encourage educators not only to adopt the mindset of the educator as a lead learner but also to model, demonstrate, and teach his/her learners the process of learning how to learn new “things”. What Happens When There Is No Curriculum? – Royan Lee (@Royanlee) flips the complaint about the constrains of the curriculum by wondering what we would do if we didn’t have one. I am neither a staunch defender of all things curriculum, nor a flag-waver for the dissolution of it. The grey in between, of course, is always far more delightful andcolourful if you allow it to be. Permission to Innovate – Adrian Camm (@adriancamm) outlines his vision for a co-created curriculum coupled with a permission for staff to take risks. … because schools are built on trust and relationships, people need to know that innovation isn’t about devaluating anyone’s work. Innovation isn’t necessarily a deficit statement. Innovation can simply refer to the introduction of something new – an idea, product, teaching approach or in creating more effective processes to create a new dimension of performance. Certainly, innovation is contextual, and what represents innovative thought and practice for one person might not necessarily be innovative for another. Being innovative however requires us to step outside of the normal and suspend our biases. Suspending our biases allows us to develop a capacity to disassociate from the way things have always been done. By developing this capacity we give ourselves permission to innovate. Learning in Perpetual Beta – Borrowing from the tech industry, Tom Barrett (@tombarrett) suggests that learning should be a state of perpetual beta, where we engage in a continual cycle of feedback. Learning in perpetual beta is all about continuous improvement with an emphasis on engineering as many opportunities for feedback as we can. How to Use Polarity Management to Support Innovation – Tim Kastelle suggests we need to find balance between execution and innovation. It is a reminder that change involves balancing between many polarities. The key to managing a polarity is to recognize when you are drifting into the negative region of one of the poles and take corrective action as soon as possible. Trying to Solve for the Problem of Education in 2015 – Elaborating on the idea of motivation and caring, Dave Cormier (@davecormier) meditates on the various challenges associated with education in 2015 in an attempt to clarify the idea of rhizomatic learning. I have had a not insignificant number of people I’ve talked to in the last 6 or 7 years say things like “this is exactly the way i think about education…” and they do it this way or can’t or are afraid to or are doing it better. I want to be able to do a better job of explaining how rhizomatic education is possible. How would it roll out to a university? A school district? Does it need to be wholesale? Can it work in pieces? Are models like Genius Hour examples of this…? I have alot of questions. Following a Shared Vision Does NOT Mean We Share Compass Headings – Grant Lichtman (@GrantLichtman) challenges the professional development model where one size fits all, instead arguing that schools need to develop a collective North Star with each teacher plotting their own journey to get there. Adults must own their learning just like students, and it will most effectively start with this: “There is our school’s collective North Star. Identify where you are with respect to its location and chart your path.” How cool would it be if you had an actual map of all of these trajectories for your school! Learning to Lead and Leading as Inquiry – Claire Amos (@claireamosNZ) shares her use of the inquiry model to support her own growth and development as a leader. As many of you will know I have a thing for teaching as inquiry, in particular I have a thing for teaching as inquiry as a means of developing future-focused adaptive expertise. Leading School Improvement – Corrie Barclay (@corrieb) reflects on the challenges with implementing change and some of the lessons learnt along the way. The SWITCH Program involved four communities of learners within our P-8 campuses. Their amazing teachers were then charged with creating flipped videos to support and enhance their learning. We were wanting to extend the learning of the students just beyond the daily grind of 9:00 – 3:30. Leading Change is Hard – Bec Spink (@BecSpink) on the difficulties and frustrations associated with leading change and the need to celebrate the wins, however insignificant they may seem. I felt compelled to write this post to celebrate the successes- however small they seem from the inside…they are pretty huge on the outside and will continue to motivate, engage and challenge me to keep on keeping on! The Need for Vision in Schools – Greg Miller (@gregmiller68) outlines why having a vision for learning is so important. What is significant is that it does not necessarily have to be complex, more importantly it needs to be clearly communicated. I know this may sound simplistic and may even appear to ignore the complexities of schools and the diversity of leadership requirements of school principals; however, without Vision, you have a rudderless ship. The Ideapreneur – David Culberhouse (@dculberhouse) suggests that one of the challenges we face today is not only coming up with innovative and creative ideas, but successfully being able to sell these within wider organizations. Turning creativity into innovation, turning innovation into acceptance, turning acceptance into adoption, and turning adoption into change, will be the work of the modern day ideapreneur. Leading Groups: Dealing with Too Cool for School & Other Personalities – Laura Hilliger (@epilepticrabbit) reflects on her time leading groups and provides a range of tips for dealing with all types. It doesn’t matter whether you’re teaching a piece of software or a concept or facilitating a workshop to hack on project or product or even if you’re organizing donors night for your local non-profit – when you are leading a group of people to work together, you will have to deal with difficult personality types. Five Takeaways About Student Wellbeing – Dan Haesler (@danhaesler) provides a summary of the Centre for Education Statistics and Evaluation’s literature review into Student Wellbeing. Although based on work in New South Wales, there are points made which go across the board. Engagement and wellbeing are at the crux of what we do in schools and if we get this right, outcomes will – largely – look after themselves (for staff as well as students). Why Teacher and School Leader Wellbeing is Critical – Jason Borton (@borto74) reflects on the importance of staff wellbeing in school and shares some of the strategies that he has used to maintain morale. We can’t continue to just add stuff to our daily workload, so if we’re going to take on something new then what are we going to stop doing to make room for it? The Speed of Things – Greg Whitby (@GregWhitby) wonders about how we might carry our schools into the digital age and what future orientated form of assessment can help us with this. I wonder whether we need to be looking at schooling in the same way countries assess readiness for the digital economy? Do we need a Digital Education Index based on key drivers? Letting Parents in On the Secret of School – Peter DeWitt (@PeterMDeWitt) suggests that we need to stop protecting parents and let them in on the supposed secrets. A challenging piece in regards to the stories we chose to tell in school. We assume there are topics that parents don’t need to know about when we engage in new initiatives or changes, when the reality is that they are the very topics that parents need to know about. They can be our biggest advocates with their very own children, and letting them in on the secret of school will help them understand that some of what we do may have changed from when they were students. Everything is Broken – in a harrowing post, Quinn Norton (@QuinnNorton) shares her insight into the level of trust we invest in the web and why this will always be fraught with risk. There’s your choice: constantly risk clicking on dangerous malware, or live under an overpass, leaving notes on the lawn of your former house telling your children you love them and miss them. Peering Deep into the Future of Educational Credentialing – Doug Belshaw (@dajbelshaw) explores the possibilities of combining open badges with blockchain, the technology behind bitcoin, to make credentialing more secure. While we wouldn’t want to entirely remove the “human” element around credentialing, a hybrid OBI and blockchain approach could add value to our current system. Machines and software are extremely good at fact-checking, whereas humans are good at meaning. We need both. My Name is danah and I’m a Stats Addict – danah boyd (@zephoria) reflects on the obsession that many of us have with all things statistics when online and how it often means so little. Stats have this terrible way of turning you — or, at least, me — into a zombie. I know that they don’t say anything. I know that huge chunks of my Twitter followers are bots, that I could’ve bought my way to a higher Amazon ranking, that my Medium stats say nothing about the quality of my work, and that I should not treat any number out there as a mechanism for self-evaluation of my worth as a human being. And yet, when there are numbers beckoning, I am no better than a moth who sees a fire. Appropriation vs. attribution. What’s ok in our digital world? – Deb (@debsnet) reflects on the challenges associated with sharing content in the digital age. Ownership in the digital world is a slippery issue. In academia, the parameters are straightforward; if you are repeating or even building upon the ideas or words of someone else, you cite them. Period. Yet this same practice does not consistently apply in the blogosphere, Twitterverse, or classroom. Please Stop Stealing Images – Chris Wejr (@ChrisWejr) continues his reflection on technology by addressing cthe question of sharing and copyright. An important read in regards to anyone who shares anything online. I strongly believe that very few of us intentionally use images as if they are our own; however, as educators, we all need to do our best to model the appropriate use of images to our students. If you want to share an image and are unsure of the reference, ask. Creative Commons is all about sharing; If you use or share images, use Creative Commons images on Flickr and provide the correct attribution. Passion or Promotion – through a series of chalking provocations, Andrea Stringer (@stringer_andrea) explores the question as to whether Twitter is a space for sharing passions or merely promoting self-interest. I so appreciate the humility and generosity of many educators who share their passion, successes, failures, blogs, lessons and reflections. I assume they do this because they want what is best for their students. Or should I say our students, as they share to make us more effective educators as Brad Currie so clearly stated on #satchat. Anyone Want to Have a Real Conversation? – Dean Shareski (@shareski) shares why he feels alone on Twitter and more at home in closed off spaces, such as Voxer and Slack. The challenge is to find a place to take that social capital and use it to challenge and provoke deeper, more interesting ideas. While I have more followers than ever on twitter, I feel more alone there than I ever have. Why Schools Shouldn’t Ban Smartphones – Steve Wheeler (@timbuckteeth) provides a thorough account as to why banning smartphones and technology is not the future and merely avoids the inevitable. Technology is like water to a fish. It surrounds us, and we rarely notice it, but we use it all the time. Instead of keeping children away from the water, we should teach them to swim. Any alternative would be unthinkable. A Bicycle for the Mind – Chris Betcher (@betchaboy) wonders about the place of iPads, and technology in general, in the classroom. An important post in regards to addressing why, rather than what that too often dictates conversation. It’s about giving students agency and independence to take control of their own learning. And with that simple goal usually comes a whole lot of change. Sometimes quite painful change, but change that has to happen. Adding technology to a classroom without reimagining how that classroom works, and rethinking what your students can do because of that technology, is a waste of time and money. Plus ça change: Why Mobile Learning is the New Impressionism – Amy Burvall (@amyburvall) provides a different take on the changes that have been brought about through mobile learning by comparing it with Impressionism. The Impressionist Art Movement can teach us quite a lot about mobile and connected learning and hopefully put us at ease so we can reframe our thinking and offer the most enriched experience possible. Keeping Alive the Ghost of Computer Rooms Past – Alan Thwaites (@athwaites) suggests that the real intent of BYOD is to stop worrying about what device students have, but rather what learning they are doing. Students already have these devices along with the skills to work out how to use them. What they lack is the opportunity to explore, themselves, how they can best support their learning using their devices. We can give them that opportunity if we choose to do so. Why Technology Alone Won’t Fix Schools – Kentaro Toyama (@kentarotoyama) addresses the myth that technology can fix schools. As he points out, it only amplifies pre-existing inequalities. Technology’s primary effect is to amplify human forces, so in education, technologies amplify whatever pedagogical capacity is already there. Blogging as an Essential Literacy in Contemporary Learning – Anthony Speranza (@anthsperanza) provides a great introduction to blogging in the classroom, providing examples of different purposes and contexts. In a traditional sense, education in the past has been separated from learning communities across location, language and culture. With technology at our fingertips and at the disposal of our students, these obstacles are no longer present as barriers; blogging is a great way of expanding the immediate classroom community. 50 Ideas for Student Blogging and Writing Online – A fantastic collaborative blog kept by the team at Edublogs, in this post Ronnie Burt (@ronnieburt) provides an extensive list of ideas to support blogging. A priceless resource for staff and students alike. As you think about writing assignments for your students, try to vary it up. Even better, give your students some choice in the type of posts they write. The end goal is an authentic and engaging learning opportunity for all. Using Seesaw to Engage Kids and Parents Alike – Lee Hewes (@waginski) provides a story that is less step-by-step instruction, more possibility and potential. An interesting read regards the possibilities of technology in the Early Years. Kids get very excited about sharing their work with their parents. With SeeSaw you can tell them what you are looking for and ask them to go off and demonstrate in order for them to take a photo or video to share with their parents. They typically scurry off excitedly to complete their work, returning to have a discussion about what they have done. This opens up an opportunity for you to either confirm that they are on the right track, or explain to them what needs to be fixed up for them to be able to share their correct understanding with their parents via the app. Publishing Your Content Online and Syndicating It Elsewhere – William O’Byrne (@wiobyrne) outlines steps for not only claiming your online presence, but then syndicating it elsewhere on the web. In the Indie Web Community, this is either known as the POSSE model or PESOS model. The POSSE model is preferred and indicates that you are publishing on your own site, and syndicating it elsewhere. An example of this is I publish it here on my self-hosted WordPress site, and then syndicate (or re-publish) it out to Medium and elsewhere. Top Ed-Tech Trends of 2015: Indie Ed-Tech – In her review of the edtech trends of 2015, Audrey Watters (@audreywatters) talks the indie web as a means of rethinking and reclaiming the open web. 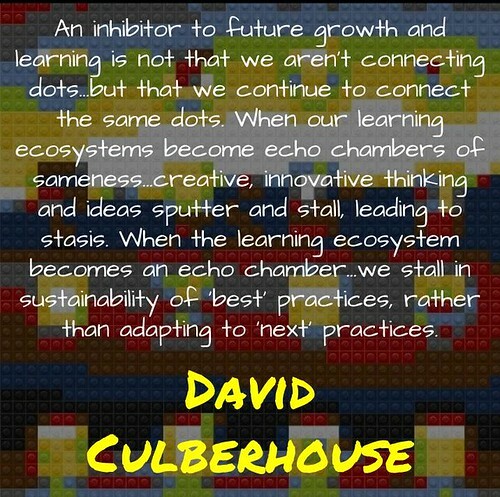 Blended Learning is Not the Next Edtech Revolution. – Phil McRae (@philmcrae) provides a thorough critique of blended learning, which in the end appealing for a more nuanced approach, rather than one dictated by corporations. Blended learning is not a new term nor a revolutionary concept for classrooms in this second decade of the 21st century. However, the way it is being (re)interpreted could be hopeful or harmful depending on how it is implemented. It is an increasingly ambiguous and vague notion that is growing in popularity as many groups try to claim the space and establish the models, despite a lack of evidence and research. We should therefore be skeptical around the mythos of blended learning before endorsing or lauding it as the next great reform. Digital Watering Holes – The team at Learn Enabling (@LearnEnabling) provided a discussion of student meeting places online suggesting that maybe we need to go to them as teachers, rather than be surprised when they don’t cone to is. Learning is social…has been that way since the dawn of time. Students gather informally and share informally and YouTube, Instagram, Snapchat, etc…these are the watering holes where students gather. Are these watering holes that teachers can use for teaching and learning? NOT Voice – A significant figure in the Digital Leaders movement (@ozdlt), Nick Jackson (@largerama) explains why endlessly focusing on voice, rather than action, misses the point. A useful commentary for thinking about the place of students in and out of the classroom. the language does matter because in some ways, student voice could be argued to have been tainted by weak, low-level empowerment of students and because we are now facing power shifts on a completely different level due to technology. Whether you agree or not, I will keep banging the action NOT voice drum. (Digital) Identity in a World that No Longer Forgets – Alec Couros (@courosa) and Katia Hildebrandt (@kbhildebrandt) suggest that in a world where there is digital record for everything somewhere then we need to learn to consider intent, context, and circumstance when considering different artefacts that may be dredged up. Perhaps, instead, we might accept that the Internet has changed our world in fundamental ways and recognize that our societal mindset around digital missteps must be adjusted in light of this new reality: perhaps, in a world where forgetting is no longer possible, we might instead work towards greater empathy and forgiveness, emphasizing the need for informed judgment rather than snap decisions. Digital Portfolios and Self-Determined Learning – Robert Schuetz (@robert_schuetz) provides an introduction to different methods for creating digital portfolios, as well as some steps for going about them. As we move rapidly from analog to digital forms of learning, it is becoming essential for us to create a cloud-based archive for our learning processes, and our favored pieces of work. Mistakes, Failures and Disasters with PBL – Cameron Paterson (@paterso) talks about the ‘failures’ he has had with Project-Based Learning and the changes that he has made along the way. I tend to throw out what hasn’t worked and start again, so I no longer have the tasks that didn’t work so well. Learning (and teaching) is an iterative process. My key message is that I need to start doing a better job of documenting my own learning. Friday Afternoon Poetry Fun – Bianca Hewes (@BiancaH80) reimagines the age old immersion into poetry by creating a series of short sharp stations which allow a mixture of play and creativity. My first lesson ever with my new year 10 class was at the worst time possible – last period on Friday of the first week back at school. Our topic? Poetry (OK, the topic is consumerism, but the text form is poetry). I knew that I couldn’t stand up and talk at the kids, or even get them to do a writing task. Why? I’m the new teacher, they’re in year 10, you work it out. So, I went for a hands on hook lesson. Festival of Gaming – Mel Cashen (@melcashen) provides a summary of her classes investigation into gaming. A fantastic example of inquiry in action from beginning to end incorporating technology in an authentic manner. From setting the culture, modelling the inquiry and for one group, me even being a team member sharing ideas and contributing. Would they have pulled it off without me? No. Would they have had as many people visit their website had it not been for me? Would the group with the arcade game thought of the idea without me. Probably not. But what I did do is show them how next time they can do it on their own. I modelled to them how amazing curiosity, inquiry, determination and failure can be. Words: the More We Learn, the More We Can Learn – Anne Del Conte (@annadelconte) provides a great example of change from the bottom up through her action research project into vocabulary. You can follow the project here and here. I hope to improve the students’ literacy skills by systematically and explicitly teaching vocabulary using various strategies borrowed from Robert J. Marzano, Paul Dufficy and Joanne Rossbridge (PETAA Paper 196). My goal is to measure the effectiveness of these teaching practices by analysing student performance before, during and after this project. Hopefully with each round of lessons I can refine my teaching practices and improve student achievement in the learning of vocabulary and in particular, tier 2 vocabulary – those words that are used to embellish and emphasise and can be used in a range of contexts with multiple meanings. Google’s 20% Time and Genius Hour – Alex Quigley (@huntingenglish) provides a critique of Genius Hour as the solution for improving student engagement and outcomes. We should not waste the precious time of our students by not guiding them within the best that is what is thought and known within our subject. Great learning requires interdependence – the independence conferred by Google 20% should be confined to the realm of our most experienced students. Outcome Versus Process: Different Incarnations of Personalisation – In a useful guide for teachers, Yong Zhou (@yongzhouED) breaks down the different ways learning can be personalised. Generally speaking, personalization can be put into two categories: process personalization and outcome personalization. Process personalization enables students to enjoy choice in the learning process, whereas outcome personalization allows students to define the end results of their learning. Process personalization is by far the most prominent version in education today because the current education paradigm has a predetermined outcome for all students. That is, no matter how one gets there, we want everyone to get to the same place: mastery of the knowledge and skills prescribed in the authoritative curriculum or standards. Does Your Practice Align With Your Belief – Edna Sackson (@whatedsaid) shares her school’s act of of recording, observing and reflecting to support the alignment of belief and practice. Viewing ourselves through the eyes of others and becoming aware of different perspectives has been both validating and enlightening. In the process of planning for and evaluating the visits and observing our school’s practice through a different lens, we have asked ourselves the same sorts of questions. Does our practice align with our beliefs about learning? +/- memorable (my ***x talk) – Encapsulating what Alan Levine (@cogdog) does so well – storytelling – this TEDx presentation touches on what is memorable in education and wonders what fills in the rest of the time. Nearly all of my teachers I talked about have no idea these things were memorable… to me. That’s why I only have photos of two of them, who I got a chance to tell them much later. So if you are trying to be memorable, you are going about this wrong. The Un-education of a Technologist: From EDUPUNK to ds106 – Jim Groom (@jimgroom) reminisces about his journey of un-education. An interesting read, if not simply for the superb storytelling, then for the rethinking of learning and (higher) education. ds106 opened up questions about infrastructure, architecture, student agency, pedagogy, and much more all at once. It wasn’t just about technology, it was about how the technology affords new ways for us to collaborate, share, and learn with and from one another. Mariposa – Jon Harper (@jonharper70bd) tells the fictional story of a girl and the challenges and choices that she makes through life up to the point of graduating. An empathetic piece that reminds us that students always have a backstory that we are never completely privy too. The Beauty of Dreams – Steve Brophy (@stevebrophy3) shares a personal story about what drives him each and every day to achieve his dreams. The power of Kev’s journey was that he had believed in this dream since he was four and had worked his tail off since then to achieve his goal. He faced rejection on numerous occasions but never let it deter him from believing in the beauty of his dream. The Role of Personality in Education – Martin Weller calls out the elephant of personality in the room in regards to Massively Open Online Courses. An interesting read if not for the debate the follows in the comments. As you’ll know, I’m a BIG FAN of Jim Groom, but it’s hard to say that DS106 isn’t a product of Jim’s online personality. Indeed it is all about that, which is exactly why it’s fun. Similarly, I think Dave Cormier’s Rhizo courses are truly innovative and beginning to explore what a networked take on education might look like. But I think Dave’s (loveable, cuddly) personality is a big factor in its success. Actors Seriously? – Eric Jensen questions the age old metaphor of teacher as an actor. An interesting post regards reimagining the role of the teacher in the classroom. Can We Talk About Change Without Hurting Feelings – Will Richardson (@willrich45) argues that we limit change by worrying about too much about feelings, rather than confronting what needs to be done. As someone who finds the experience of traditional schooling to be increasingly out of step with the real world, and as someone who has come to believe that schools actually are “broken” in many ways, how do I write and speak about those viewpoints without being heard or read as hurtful or demeaning to educators in schools? Is that possible? A Learning Revolution or a Learning Renaissance – In something of a thought experiment, Matt Esterman (@mesterman) compares the difference between a revolution and a renaissance in regards to educational change. Calls for a learning revolution have been sounded for at least 10 years, in some cases a generation, in others such as John Dewey well over a century. This is a significant lack of progress in any sense of a revolutionary timeline. I call this a neverlution rather than a revolution. An Alphabet of Inspiration – Inspired by Austin Kleon’s idea of a creative genealogy, Steve Mouldey (@geomouldey) wrote a list of people who inspire him. A great reminder that it takes a village. One of the great points I got out of Steal Like an Artist by Austin Kleon was that of your creative genealogy. Who are the people that inspire you, whose ideas have added to your creativity; whose ideas can be seen remixed in the work that you do? Caring About Sharing – Ian Guest (@IaninSheffield) wonders why some people are more willing than others to share ideas and resources. Perhaps these teachers have found ways to overcome the organisational, cultural, legal and technological barriers (Charlesworth et al, 2007)? Or perhaps they recognise the value of participating in a community of sharing which delivers benefits. Working Out a Schools Competitive Position Even When It’s Not Competing – Ewan McIntosh (@ewanmcintosh) suggests that every school has two value propositions which make it stand out and provides a long list of examples. A value proposition, even if you are a state school, is a vital value to hone down, not just so that kids aren’t ripped out of your school but so that everyone, including the leaders, can be held to account when kinks in the system appear. If you state that excellence in education is your value proposition, then you’d better get that nailed, all the time, every time, or perceptions will change and take a long time to bring back. The Good School – Dale Pearce (@dalepearce3) asks the question as to what makes a good school and wonders if this is really demonstrated through the statistics presented on the My Schools website or school ATAR results. Parents make schooling choices based on a wide range of factors, including results, and we do them a disservice with much of our current representation of those results. We need a better understanding of what a ‘good school’ looks like. Who is Your Schools Anthropologist – Jason Markey (@JasonMMarkey) asks who is documenting, in a non-judge mental way, what is happening on a day to day basis at your school? What are the observations we should look for in our schools and what are the questions we should ask students and teachers about their experiences to think with an anthropological mindset? Work Life Balance is a Myth – Paul Browning (@PaulDBrowning) reflects on life as a headmaster and some of the strategies he uses to find life balance. Work-life balance for me is knowing the limits and making sure I listen to my body. It is about taking time each week to rest and switch off. I know I have to be disciplined to do this. It would be nice to tie all these narratives together, but that is not always the way it is. So what about you, what are the posts that have made an impression on you this year? As always, feel free to share. Voices in the Village (2015) by Aaron Davis is licensed under a Creative Commons Attribution-ShareAlike 4.0 International License. This is an amazing collection of ideas which must have taken a lot of thinking to draw together into one post. I’m aware of some of the bloggers, but there are others here I haven’t come across, so thanks – this is a great way to find out what some of the other ‘voices in the village’ are talking about. A lot of thinking over a lot of time Corinne. I think that collecting the posts was the easy part. What I grappled with for a bit was how to present them. Multiple posts? Just as titles? With a biography providing background? With some sort of category for each post? An image for each one? The more I thought, the bigger it grew. Was one of those ideas which you agree to because of the why, but fail to properly fathom what is involved in the what. In part I was inspired by Culberhouse’s quote. While I am also interested in the recent growth of ‘newsletters’. I also just wanted something more than a summary of my ‘Top Posts’ that celebrated the village, rather than some false chiefdom that many such posts perpetuate. In the end, I really like the idea, but think that there is a better way of presenting it. I will continue to think. If you have any feedback, it would be appreciated. WOW! An outstanding collection of reflections by outstanding thought leaders which provoke, affirm, challenge and offer insights for might be in the exciting world of schools. Well done for thematically ‘pulling them together’. It is really interesting looking at all the posts. So many voices converging on similar topics/challenges. I wonder how we make smarter rooms, conducive to deeper conversations. I would like to think this is a start. What a GREAT post Aaron. So many excellent trains of thought to follow up on! I always appreciate how widely you read and how you treat the ideas you encounter with such deep consideration and thought, and then share them with others. The level of curation in this post is just brilliant. Thanks! Thank you for the kind words. On writing, I think that I should do more things like Hangouts and Podcasts, so we all find our voice somewhere. In regards to ‘reading’ you come across as someone who reads a lot of books. I must admit, I read more blogs than most – probably. But there is something social, something open in it all. Books don’t always have the same sense of community and conversation.